Can Payback turn around a series on the wane? Electronic Arts’ arcade-style racing franchise Need For Speed has been around since 1994, but recent outings have earned it a reputation as the videogame equivalent of a Dan Brown book. That’s because it sells fantastically well, but nobody can fathom why. How refreshing it would be to assert that the latest iteration, Payback, marks a triumphant return to form for the series. But alas, having played it, that would be an impossibility. The Need For Speed games have had various high points in the past such as 2010’s Hot Pursuit and 2013’s Rivals, but the series’ most recent outing, a reboot released in 2015, attracted a critical mauling mainly due to its annoying online-only structure. Both Hot Pursuit and Rivals were made by Criterion, British developer of the revered Burnout series of games. The shadow of the far superior Burnout – an IP still owned, although apparently shelved, by Need For Speed publisher EA – still looms large over the Need For Speed series, and the likes of Microsoft’s Forza Horizon games have offered stiff opposition recently. Past Need For Speed games often featured a cops versus robbers theme, but Payback eschews that in favour of street-racing – along similar lines to Rockstar Games’ much-loved but now dormant Midnight Club franchise. Payback’s action takes place in Fortune City, loosely based on Las Vegas (although, mercifully, with much more elevation changes than its real-life counterpart). The main character you play is Tyler Morgan, an aspiring street-racer who becomes indebted to a casino-owner whose Koenigsegg – which Morgan was driving – is stolen by a woman called Lina Morgan, who runs Fortune City’s street-racing scene for an organisation called The House. Morgan assembles a crew whose motivation is to get revenge against Navarro and take down The House. One of the reasons that Need For Speed: Payback creates a poor first impression is that it plunges you into its unrelentingly embarrassing story. The characters are either terminally dull, downright annoying, or both. Making matters worse is the fact that whenever you get to an interesting point in a story-mission – such as having to nail a precise jump – the action is taken out of your hands and a cut-scene kicks in. Payback is clearly attempting to attract an audience addicted to movies like Fast & Furious, but it fails spectacularly, in a great, whiffy cloud of amateurishness and dialogue that Michael Bay would reject for being too basic. While the story missions are something to be endured, there’s better news elsewhere: you must grind to unlock each story chapter and, for once, the grinding is the most enjoyable part of a game. 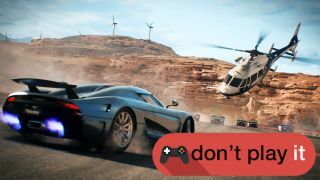 Payback isn’t an intrinsically bad game: its open-world is large and varied, and the cars handle as you would expect in an arcade-oriented game. Although the off-roaders have an annoying tendency towards fish-tailing, for the most part the cars are satisfyingly tail-happy and eager to drift, so you can turn in early and back them into corners, Ridge Racer-style. You do get the odd sequence where you must fight off cop-cars, and there's a mechanic which lets you barge into them, sending them off the road into spectacular Hollywood-style pile-ups (although the game doesn’t dwell on those as much as it should). Overall though Payback’s vehicular combat system completely lacks the precision of the one found in the decade old Burnout games. The sheer glee associated with the sort of maniacal driving you could pull off in games like Burnout is completely absent from Need For Speed: Payback. At least there’s plenty to do in Payback’s open-world, including street racing, off-road racing, drifting and drag-racing missions. You can earn experience points by racing through speed-cameras, jumping through billboards, catching air off jump-ramps, time-trials along stretches of road, collecting giant chips and racing ghosts of real-life players. There are derelict cars to find, which can be customised into absolute beasts. But every element of Payback’s open-world can be traced back to another game, like some box-ticking exercise. Its design by committee at its worst, and its one of the game's biggest problems. Customisation is key to any game that aspires to excite wannabe street-racers, and Payback does contain some interesting customisation systems. There’s a decent visual customisation engine – performing spectacular moves in the game unlocks spoilers, side-skirts and the like, and you can tinker around with decals and paint-jobs to your heart’s content. But at the heart of Payback lies its mechanical upgrade system, which takes the form of a trading card game. It's not ideal, and the presence of this element merely smacks of marketing departments looking at how much a young audience is spending on the likes of Hearthstone (something of which Forza Motorsport 7 is also guilty). Unless you go to Tune-up Shops and spend in-game currency on Speed Cards, you’ll soon find yourself up against much faster cars. Naturally, you can spend real money on Speed Cards if you can’t be bothered to grind – or can’t quite fathom the unnecessarily complex and utterly unengaging Speed Card system. There is one interesting idea in Need For Speed: Payback: before each event, you can put money on a side-bet, which adds extra targets for that event. However, even that could have been improved if it the target was adjusted according to the rating of your car, and whether or not you were struggling to win that event. Incidentally, you have to win all the events to advance the story, so if you aren’t keen, say, on the drifting side of the game, you’re a bit stuffed. It will be fascinating to see how well Need For Speed: Payback sells. It is, for example, much less fun to play than Forza Horizon 3, which has been out for a while and can be found cheaply. No doubt EA’s marketing machine will kick into overdrive on Payback’s behalf, but those who buy it will surely find it soulless at best, and positively annoying in parts at worst. But the same could have been said about previous Need For Speed games, which nevertheless shifted millions of units. However, surely the Need For Speed franchise is now one flop away from a radical reappraisal? If only EA would abandon it in favour of a revival of Burnout. TechRadar's review system scores games as 'Don't Play It', 'Play It' and 'Play It Now', the last of which is the highest score we can give. A 'Play It' score suggests a solid game with some flaws, but the written review will reveal the exact justifications. For our top gaming recommendations, check out our guide to the best Xbox One games and best PS4 games.